I have been baking this morning. The kids are home from school on a weekday and they are crying in their rooms as I write this post. I can hear words and phrases shouted through their doors like ‘stupid’ and ‘you knocked down my castle’ and ‘the Wally books are mine’ etc. Amidst the chaos of two little boys that has turned from play-mates to boy-fights in seconds, I keep my sanity by baking. For a Goose party I have been invited to join tomorrow night. My Friends A (the dumpling sauce drinker) and AT (the pudding philosopher) are having a friend come an cook a goose. I have heard rumours of salted caramel tarts and others who share my passion for food and books. I figured I could bring a canape, while we wait for the goose to cook. 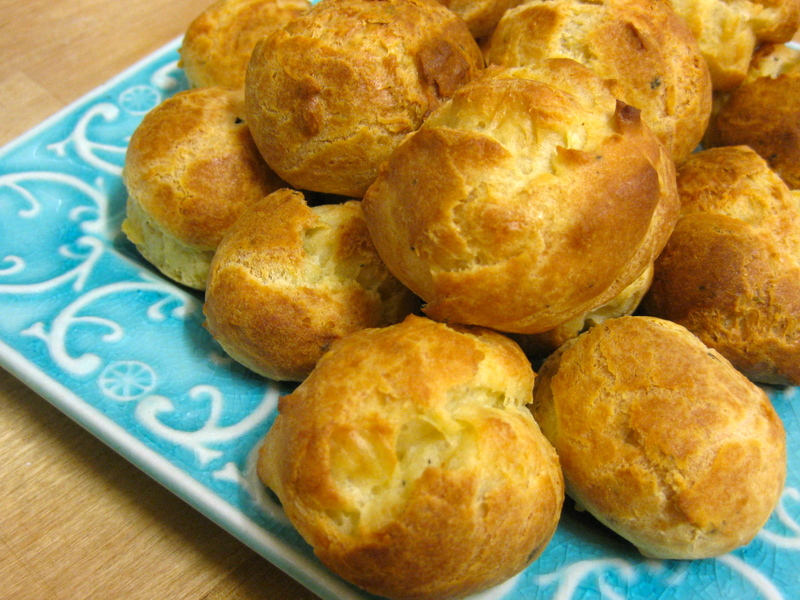 Mum made gougeres made with Gruyere over Christmas last year and they were so light and delicate. She they were easy.But then, she said making macarons was easy. I tried Emeril’s Blue cheese Gougeres this morning, and I am very happy with the results. I didn’t have everything to make his ‘essence’ but I put in what I did have (paprika, black, white and cayenne peppers, oregano). I used some Tasmanian blue cheese and halved his recipe quite successfully. It was touch and go for a moment, when I had to incorporate the eggs into the ball of dough, I thought it would never integrate…but it did. I even pressed down the pointy bits, as I had read somewhere in another recipe. The flavour is light and lovely, the texture is crisp on the outside and soft on the inside. Goose party here I come!! !